HMS Daring has paid its first visit to the Crown state of Jordan. The Ship berthed at the Royal Jordanian Naval Force HQ, close to the port of Aqaba, as she prepared to join the Combined Maritime Forces Task Force 150 operating in the Red Sea. It was the first visit by the Type 45 Destroyer now that she has entered her area of operations following her passage through the Suez canal. The visit provided an opportunity to highlight our close ties with Jordan, a long term ally of the United Kingdom. 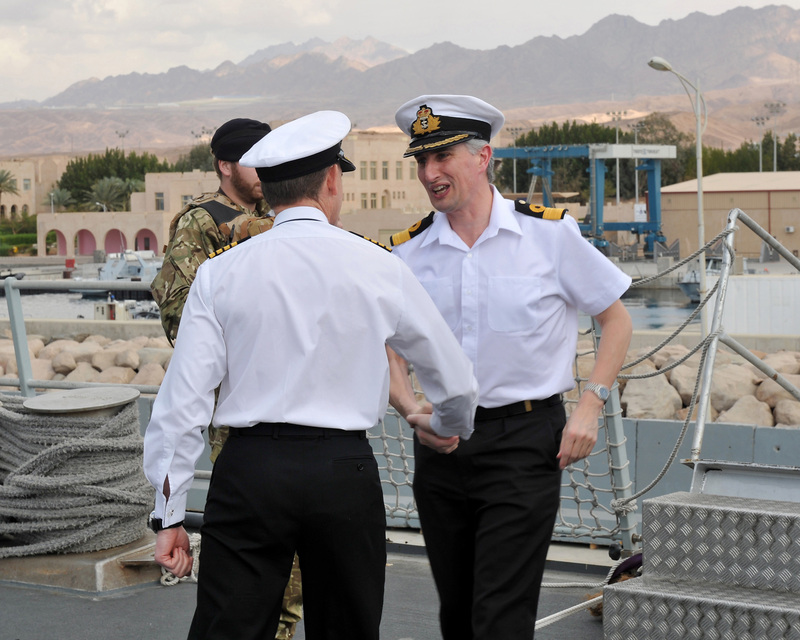 Commodore Simon Ancona, Deputy Commander of Combine Maritime Forces, based in Bahrain, saw the visit as an opportunity for him to meet with the Captain and crew of Daring and with senior Jordanian Naval personnel. HMS Daring is in the Middle East as part of the Royal Navy’s long standing commitment to the Gulf, which has seen British warships in the warm waters since the 1980s. 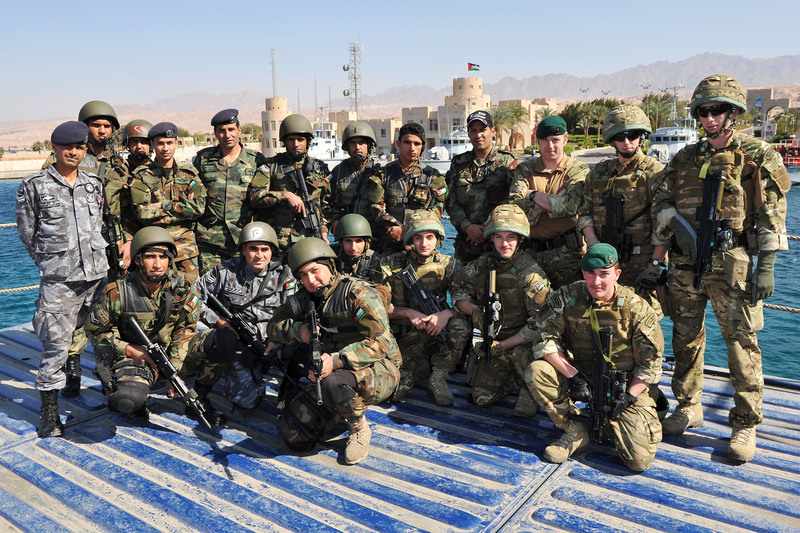 The Ship’s Royal Marine boarding team was provided with the opportunity to conduct board and search exercises with their Jordanian counterparts on the Royal Jordanian Naval Force’s specially built training vessel. Daring hosted over 75 guests and VIPs, including the UK’s Ambassador to Jordan, for a capability demonstration as part of an official reception. This was followed with a visit by the King of Jordan’s youngest son, Prince Hashem, while ship’s tours were also provided for Aqaba School children and for Jordanian Naval Trainees. The visit to Aqaba provided the Ship’s Company with a short period of downtime on their seven month deployment. This opportunity was seized by over 160 of the Ship’s Company to visit the impressive ruins at Petra, deemed by many to be one of the new “Seven Wonders of the World”. Able Seaman (CIS) Chrissy Howie was able to go on one of the tours of the site, she said: “The ruins were amazing, seeing such ancient sites in the sand swept desert was a once in a lifetime opportunity. Having visits like this after long periods at sea is fantastic”. Daring and her Ship’s Company will eventually head to the Arabian Gulf and will be conducting tasking ranging from maritime security, counter piracy, capacity building and the wider maritime security effort for maintaining stability in the region, including Humanitarian Aid / Disaster Relief. She will also work with other partner Navies in the Combined Maritime Task Forces, a 25 nation international partnership who coordinate their collective military and multi-agency assets to safeguard and build capacity in Maritime Security operations in the region.